Hours after Sen. John McCain (R-AZ) shocked the political world by adding Gov. Sarah Palin (R-AK) to the Republican ticket, the duo sat down for an interview, but not with Tom Brokaw on Meet the Press or with a reporter from The New York Times. Hours after Sen. John McCain (R-AZ) shocked the political world by adding Gov. Sarah Palin (R-AK) – a little-known figure outside of her home state of Alaska – to the Republican ticket, the duo sat down for an interview, but not with Tom Brokaw on Meet the Press or with a reporter from The New York Times. The GOP campaign chose People to introduce Palin to the world, just days after the families of Democratic Sens. Barack Obama (D-IL) and Joseph Biden (D-DE) picked the same title for a feature on their ticket. In a tight election, voters want to know about the candidates' personal lives, as well as their policy positions and voting records, Larry Hackett, People managing editor, tells PRWeek. He adds that People has covered the lives of presidents and their families since the Ford administration. Although celebrity media coverage of the election has increased this year, candidates have reached out to voters who aren't political junkies through personality-driven features and TV segments for decades, says Tom Hollihan, professor at the University of Southern California's Annenberg School of Communication. “Over the past several elections, there's been a smashing together of entertainment and news,” he notes. “We had [soon-to-be President Bill] Clinton go on The Arsenio Hall Show and play the saxophone. We had [Gov.] Arnold [Schwarzenegger] announcing his candidacy on The Tonight Show. So it's not surprising that there is an extension of this. The magazines are realizing that politicians have become celebrities. 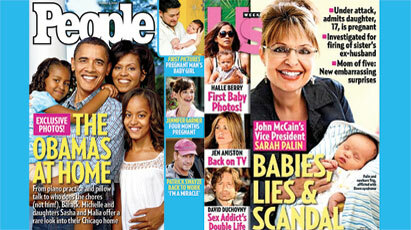 However, Us Weekly, which, like People and OK!, featured Palin on its cover, faced reader complaints of anti-GOP bias over its front-page copy: “Babies, lies, and scandal.” More than two months earlier, the title ran a cover feature on the Obamas with the title, “Why Barack loves her,” featuring the Democratic candidate and his wife embracing. Us Weekly received about 1,000 cancellations and new subscriptions apiece the week of the Palin cover's publication, a magazine spokesperson told The New York Times. Janice Min, Us Weekly editor, told the Times that the presidential campaigns are marketing the candidates as celebrities in their own right. Us Weekly's story on Palin was clearly negative, says Joan Deppa, associate professor at Syracuse University's Newhouse School of Public Communications, who adds that celebrity and entertainment titles generally don't have a mission to tell both sides of a story in the same way that news publications do.